Biking is a great way to explore the city and New York City is working extremely hard at creating a good bikepath system. Even so, it’s not always easy to get around on a bike. Many places can be reached easily, but there are also many places in Manhattan that are hard to get to. Traffic can be overwhelming and on some big crosssections the cars seems to come from everywhere. I find it terrifying at times but Newyorkcitytripper Daphne seems to think that it’s not all that bad. Biking on and off pavements gets annoying and having to stop for the many traffic lights drives me crazy! We’ve done a lot of bikeriding through New York though. 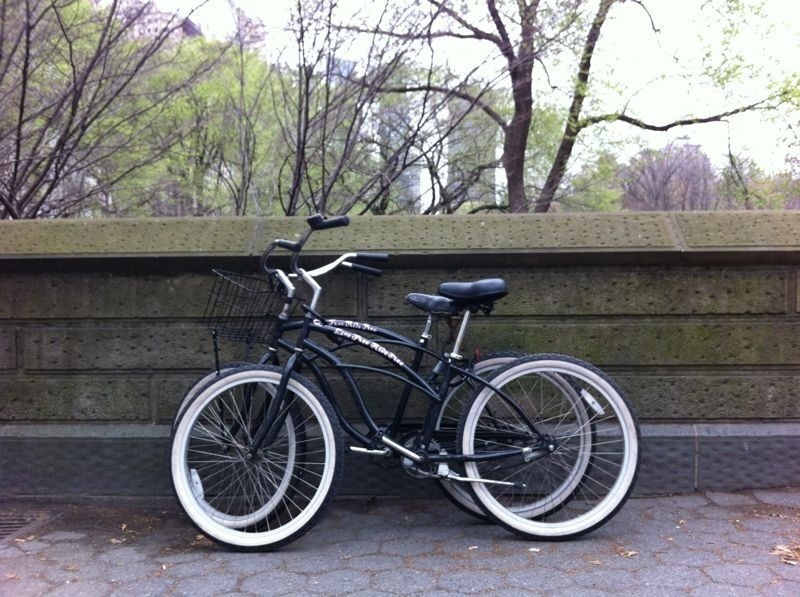 If you’re a firsttimer in New York then my advice would be to keep it simple and just bike around Manhattan. There’s a great bikepath along the Hudson. 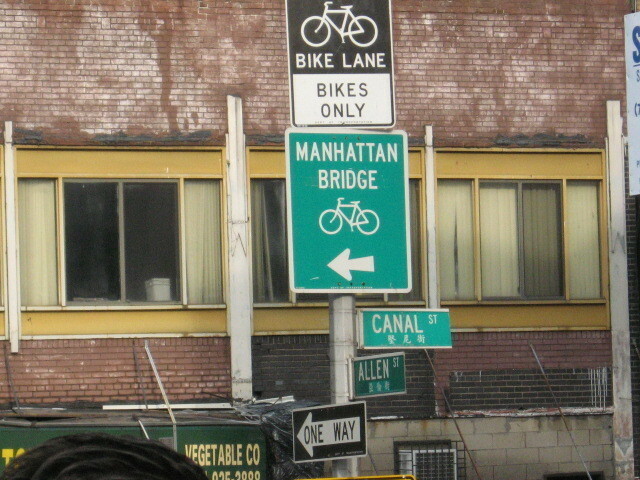 Or follow us on our biketour through Brooklyn, that’s also easy and fun. I would certainly not suggest that you do what we once did; bike from uptown to downtown along Broadway. All of a sudden we found ourselves in the middle of Timesquare and then the bikelane just disappeared. We asked a policeman who was standing there if he knew where to go and that resulted in a neverending speach about how dangerous biking through Manhattan was. He certainly wasn't a good ambassador for the city’s bikeplan. “Do you wanna get yourselves killed" (no sir), did we think it was the freaking Netherlands where people were practically born on a bike? Bladiblablabla....he went on and on about cars, trucks, taxidrivers etc. He pointed us to where the bikelane picked up again, mumbled something about “don’t do that anymore” and left me scared and shaken. On one of our first trips we booked a biketour. To me that is still one of my New York City highlights. We first did the “Back to the Old Country, The Ethnic Apple Tour”, tour A of Bike the Big Apple and "The Park and Soul Tour" - through Central Park and Harlem, including a visit to a Gospel Choir - another time. You meet the group at a bikestore and are introduced to your guide. If you say your from Holland you’re ok (we saw people actually have to take a little “are-you-sure-you-can-ride-a-bike-test). A short time later you find yourself on a bike, with mandatory helmet on, following the tourguide and with a security guide who comes along to be the last in line. There are many stops along the way where you get an explanation about what you see and where you can take pictures and such. Don't worry; it’s way more fun than it is a history class. There’s a coffee and a lunchbreak in between and you’re given suggestions on places to go. We ended up in places that we would have never gotten to ourselves. I’ll never forget that first time biking on the Queensboro bridge with cars and trains passing underneath me. It is a great way to experience the city. And I’ll do it again for sure. It was well worth the 99$ which includes the bike, the helmet and a great tourguide/-crew. Also interested in doing a tour with Bike the Big Apple? Check their tours and schedule here.